Twice a year, students are provided a copy of their academic transcript which shows total credits earned and are encouraged to review in detail to determine if they are on-track for graduation. Students who are deficient in credits or subject requirements need to meet with their counselor right away to develop a plan to get back on track. For most students, this means attending summer school or completing additional independent study work during the regular school year. 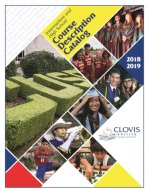 The Course Description Catalog describes Clovis Unified School District's curricular offerings for the 2018-2019 school year. In collaboration with their counselor, students are encouraged to select interesting and challenging courses that will best prepare them for post-secondary experiences and options.